This barrow, topped with tall thin conifers, is very visible from the road. The barrow was excavated in 1964, and found to be the final stage in a series of monuments. At its heart were four cremations (dated to c.2860 BC) in a rectangular stone enclosure, and two ramped stone or wooden post holes. The cremations and holes were inside a penannular ring-cairn, over which the turf and stone barrow were built. 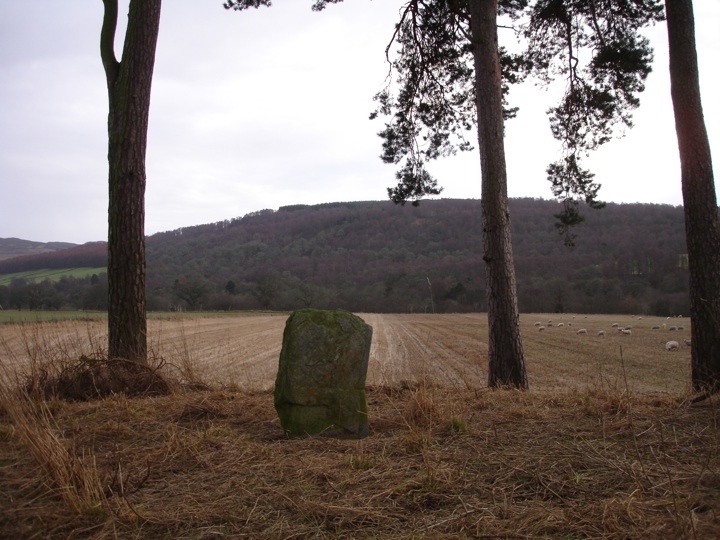 On top of the barrow is a standing stone, under which a fifth cremation was found (dated to c.2270 BC). The perimeter of the barrow was originally bounded by a dry-stone kerb, but this has now been confused by ploughing and field clearance. On the south side of the barrow is a large square recumbent stone which isn’t mentioned in the CANMORE report, and so may also be field clearance. Pitnacree is in the parish of Logierait and the county of Perthshire. Published on the 14th of May 2010 at 4:20 pm. Updated on the 31st of March 2011 at 7:57 am.